Easy Erase | Pro Chem, Inc.
EASY ERASE is a zero VOC (Volatile Organic Compounds), zero HAPs (Hazardous Air Pollutants), low odor clear gloss that turns any surface into a writable/erasable surface. Once coating has dried, you can use any dry erase marker to draw or write on the EASY ERASE surface. Cleanup is easy with a dry cloth, eliminating the need for the use of any harsh chemicals. It can be applied to any painted surface and dries to a clear, glossy finish. To have a different color than the wall color, simply apply over a base coat. 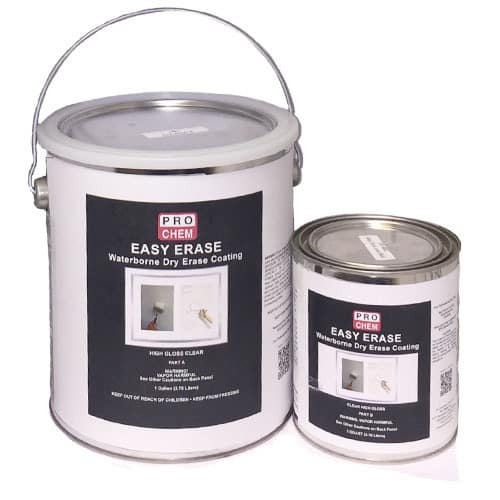 A base coat must be used if you are applying EASY ERASE to a non-finished surface such as bare drywall, plaster, wood, masonry, aluminum or galvanized metal. Mix Part A thoroughly. Add the full contents of Part B to Part A and blend completely (3-5 minutes). A drill mounted impeller is recommended for best mixing. Do not add water to individual components. Apply when air and surface temperatures are 50-90°F and the relative humidity is less than 85%. Do not apply if rain is expected within 48 hours of application. Do not exceed spreading rate as this may cause pinholes, microblistering or a milk appearance. If over 12 hours lapses between coats, lightly scuff sand the surface and remove all dust before applying the next coat. See label for full directions.